by Elaine Gloria Gottschall, B.A., M.Sc. Once bacteria multiply within the small intestine, they can destroy the enzymes on the intestinal cell surface, preventing carbohydrate digestion and absorption. At this point, production of excessive mucus may be triggered as the intestinal tract attempts to "lubricate" itself against the irritation caused by the toxins, acids, and the presence of incompletely digested and unabsorbed carbohydrates. The diet is based on the principle that specifically selected carbohydrates, requiring minimal digestion, are well absorbed leaving virtually nothing for intestinal microbes to feed on. 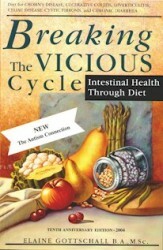 As the microbes decrease due to lack of food, their harmful by-products also diminish. No longer needing protection, the mucus producing cells stop producing excessive mucus and carbohydrate digestion is improved. The Specific Carbohydrate Diet corrects malabsorption, allowing nutrients to enter the bloodstream and be made available to the cells of the body, thereby strengthening the immune system's ability to fight. Further debilitation is prevented, weight can return to normal, and ultimately there is a return to health.